Home › Electronics › Apple Ipod Touch 5Th & Ipod Touch 6Th Generation Case Case Army Ipod 5 & Ipod..
Apple Ipod Touch 5Th & Ipod Touch 6Th Generation Case Case Army Ipod 5 & Ipod..
Unlock ArmyTM is a Case ArmyTM Authorized Online Dealer. All Case ArmyTM products come with Limited Lifetime warranty against defects. ATTENTION:: All the Authentic Case ArmyTM products are sold only by Case ArmyTM, Unlock ArmyTM and other Authorized Online Dealers. All rights reserved. All trade names are registered trademarks of respective manufacturers listed. Apple, iPhone, iPad, iPod are registered trademarks of Apple, Inc. Apple does not endorse use of these products. 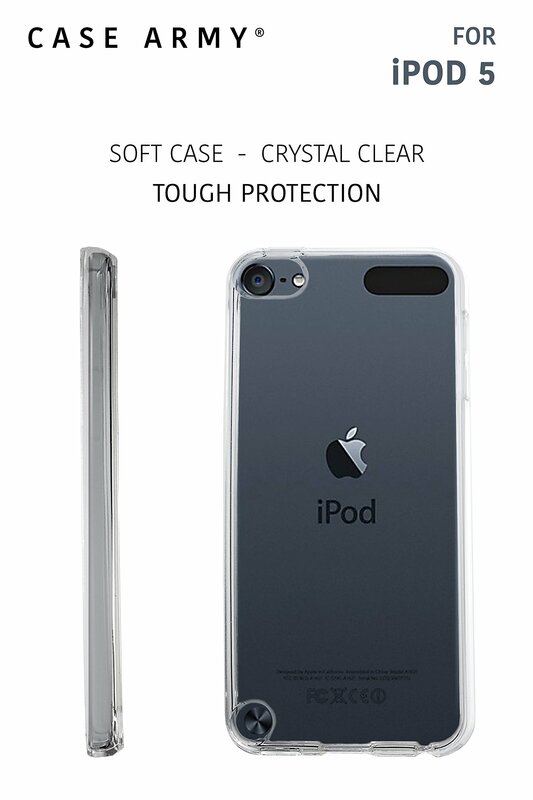 Crystal Clear Transparent Soft Silicone for Apple iPod Touch 5th & iPod Touch 6th Generation. TPU Edges on all Sides and Buttons for extra protection. Unlock ArmyTM is a Case ArmyTM Authorized Online Dealer. All Case ArmyTM products come with Limited Lifetime warranty against defects. ATTENTION:: All the Authentic Case ArmyTM products are sold only by Case ArmyTM, Unlock ArmyTM and by other authorized online Dealers. New Case ArmyTM Soft Silicon Full Case compatible with Apple iPod Touch 5th & iPod Touch 6th Generation, Keep your Apple iPod Touch 5th & iPod Touch 6th Generation safe and protected in style with this Plastic rubber skin case accessory Use this case to reduce the chance of signal loss Delivers instant all around protection from scratches Constructed from smooth, treated rubber that resists dirt and stains TPU, also known as thermoplastic polyurethane, is more cut and tear resistance over rubber. It is abrasion resistance, and has a high degree of transparency. Compared to silicone skins, this skin is stiffer to the touch, but remains flexible Unique design allows easy access to all buttons, controls and ports without having to remove the skin Shock absorbent to a level, shatterproof, and anti-scratch material Color: Clear Material: Rubber and Plastic Size: Perfect fit Case ONLY, Apple iPod Touch 5th & 6th Generation not included. Apple does not endorse use of these products. All rights reserved. All rights reserved. All trade names are registered trademarks of respective manufacturers listed. Apple, iPhone, iPad, iPod are registered trademarks of Apple, Inc. Apple does not endorse use of these products.